After the blogger dinner at Newport Seafood, some of us still weren't satiated. Somehow, the topic of The Hat came up in discussion--I think because Ryan had never been--and it was decided that we'd go there for the after-party. Joining Ryan and I were Cathy and the "three pandas:" Danny, Wes, and Evelina (who ended up wandering across the street to get dessert at Crepe Luv). 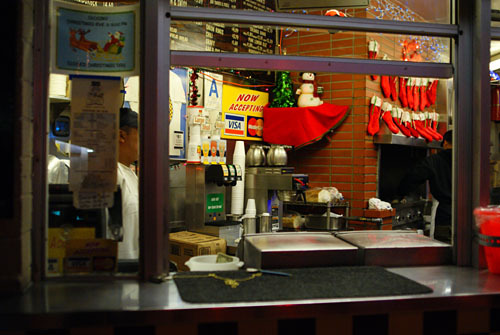 For the uninitiated, think of The Hat as a Los Angeles fast-food institution, an iconic eatery on par with the likes of Tommy's or Pink's. Founded in 1951, The Hat specializes in pastrami sandwiches--the pastrami dip--and to a lesser extent, burgers. 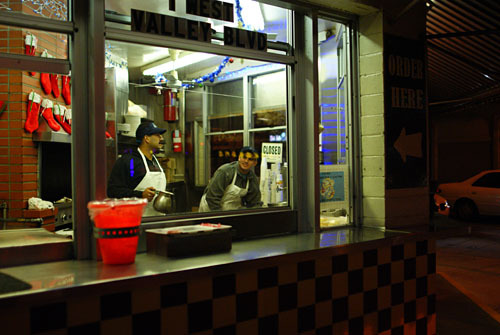 We were at the original, the very first outpost, situated at the corner of Valley and Garfield. From here, The Hat eventually expanded outward, opening up another nine locations throughout Southern California. Currently, the chain is owned and operated by C & J Food Company, which is run by the Conzonire family of San Marino. 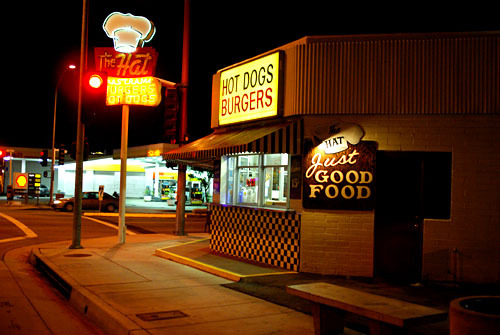 During the 1950s, Ronald H. "Corky" Conzonire and wife Marilyn used to meet at this original Alhambra location. The place held a special place in their hearts, and in 1981, when Corky heard that the store was marked for demolition, he bought the place with his brother Joseph. The rest, they say, is history. The menu is about what you'd expect, with the Pastrami Dip clearly taking center stage. Click for larger versions. Originally, we were just going to order the Pastrami Dip, but at Newport, Christine insisted that we try the chili-cheese fries, which she described as "a brick." And indeed, it was suitably massive, unabashed in its considerable corpulence. I quite enjoyed the chili, which I even found superior to that of Tommy's--I appreciated its richer texture, its "meatier" sapor, and how its gravity was cut by the tangy pickles and juicy tomatoes. The frites themselves were also quite nice, crisp but not overly so, demonstrating that classic French fry flavor. Overall, the chili fries here compared very favorably to those from my chili fries benchmark: my old high school haunt, Volcano Burgers. One thing though: Volcano does use onions on their fries, and I think that incorporating them here would make the fries even better. Christine had warned us of getting the Pastrami Dip, saying that the version at Langer's was much superior. 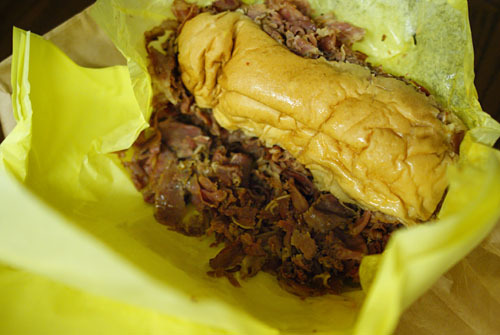 Be that as it may, we just had to get the World Famous Pastrami, especially since Ryan hadn't had it before. The meat, a half-pound of it, comes with mustard and pickle, and is served on a French roll. However, as we can see here, the pastrami was clearly too much for the piddly bread to handle. As for the flavor, it tasted as it should--delightfully salty, with a tinge of smokiness, finished with a slight herbal tang. The sandwich wasn't earth-shattering, probably not as strong as the pastrami at Carnegie Deli either, but I certainly enjoyed it. 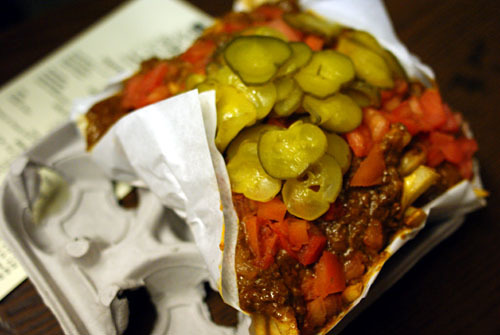 Hint: for an extra special treat, sprinkle some of the pastrami on top of your chili fries! And so there we have it--some greasy, fatty, downright insalubrious junk food--a perfect way to cap off the evening perhaps. As the sign says, it's "Just Good Food." Kevin, you must get yourself to Langer's. Though I haven't tried Carnegie, it's better than Katz's by a mile. we do wine lunches with the Hat. I love the Hat!!! 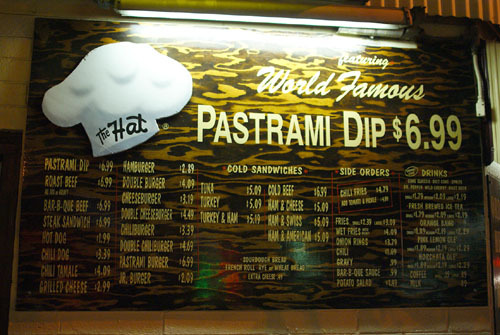 oh to the pastrami fries. 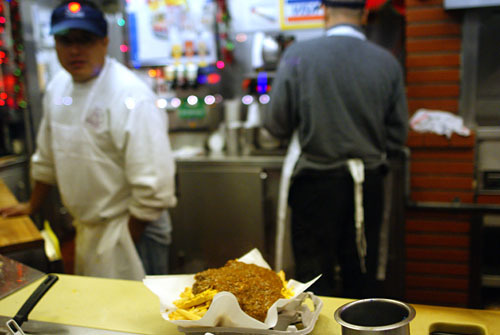 Get chili cheese fries and ask for pastrami. $5 but super oily and fatty! Looks delicious. Canter's is another decent location for pastrami. I would give a slight edge to Langers, however. EatTravelEat: Yes, she made that clear to me on Twitter! Andrew: I know, I know. But their 4:00 close makes it difficult for me. I'm not a lunch person. Alex: Yep, I've heard good things about Canter's as well. But the consensus seems to be Langer's, as you've mentioned!